These are my two major cities in The Scrivener’s Tale. Fantasy stories don’t just come in series simply out of habit; for the most part these tales are epic in scale – with big stakes and a big cast – that require some room to move and develop worlds with all their history, culture, social set up, architecture, politics, spirituality, etc. Then there’s the magic – a whole new beast to consider – how does it work, what are its rules, who can wield it and why…and when? Then there are the characters, often a host of them and that cast keeps growing through the volumes, each member requiring backstories and lives with personalities to be developed. Phew….no wonder fantasy authors need lots of pages. So with that in mind once the decision was made to break my mould of the last dozen years and write a single volume fantasy, choosing to return to Morgravia was easy … it was always my favourite land and Pearlis a capital city that felt instantly familiar. Most importantly, all of the features I’ve just described in terms of ‘world building’ were already done for me in The Quickening. Readers familiar with the story would slip back into the land of Morgravia with ease and new readers wouldn’t find it challenging because it smacks so strongly of the world we know. The real bonus for me, though, meant I could just hit the world running, so to speak, and I didn’t need to commit precious words to developing all of those components in a big story that had to fit into one book. To add a twist to the tale from the start I wanted it to be a parallel world story where someone in our world finds a way through to Morgravia. The challenge was working out how and in employing magical means, making that feel credible and in a way alarming enough that a reader would let it rip, go with it, trust it and be eager to find out why it occurred and what is going to happen to that character. That’s the basis of all magic in essence. It’s not a case of fooling the reader. Not at all! It’s winning your trust, craft the magic to feel effortless within the world and if as the writer I can earn that trust and promise not to break faith with it, then the magic works and readers don’t stop to question it because it feels seamless, it feels credible even though we all know it’s make believe. Anyway, back to the landscapes. 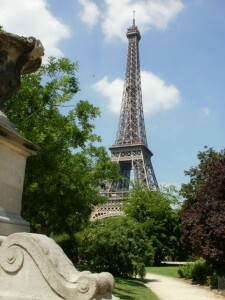 Paris has been my gateway of choice into Europe since I moved to Australia more than three decades ago and coming out of the travel industry ten years ago meant I had been travelling regularly through Europe for most of those thirty years. It’s a city that not only I love but the rest of the world loves too and even though it’s a familiar stomping ground I still wouldn’t say that I know it well. It still surprises, challenges, delights … and I do feel like a tourist still and it’s impossible to get bored of because I learn more about it with each visit. Paris is made up of neighbourhoods and although I have favourites there is something to love about all of them and they vary markedly. When you walk Paris, rather than drive it, you can feel the change of pace or personality as you move between these neighbourhoods or arondissements as they are called. Although I’m originally English, for some reason Paris felt like the perfect choice for my ‘real world’ city where we meet the somewhat lonely Gabe Figaret in his Left Bank apartment and I’ll tell you more about his neighbourhood in another blog. And fortunately for me, I was required to do intensive research on Paris for my novel The Lavender Keeper and that meant I could do side by side research for The Scrivener’s Tale and share the load out over all the costs. Research is expensive, there’s no escaping it, but too valuable in terms of a book’s depth and richness to ignore and so I was lucky to be able to walk through all of the streets that Gabe does and get to know his stomping ground so that it felt easy to write those early chapters. Pearlis, by contrast, I carry around in my head. I can’t research it, I can’t walk the streets – other than in my imagination and I can’t smell it, or touch it, hear it or taste it. Nevertheless, it is achingly familiar and real enough for me that I can engage my senses. The trick, of course, is being able to engage yours by making Pearlis feel real enough to you too. Pearlis is every inch a thriving metropolis that Paris is, except Pearlis is medieval and the city we enter when we meet Gabe is contemporary Paris. And Pearlis too has an amazing cathedral that is visited annually by thousands of pilgrims…more on that aspect in another blog. 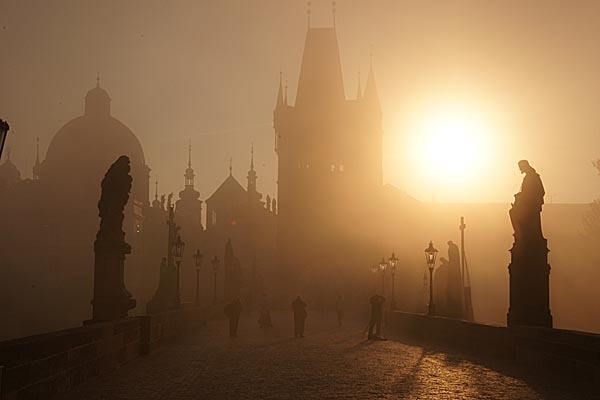 The inspiration for Pearlis originally came from a visit to Prague ten years ago. I loved its famous Charles Bridge – built by King Charles lV – with all its statuaries of saints that line the huge bridge in imposing style and connects the royal palace with the Old Town. It was indeed the bridge that captured my attention and inspired the city of Pearlis to start coming together in my mind for The Quickening trilogy. Paris is a city of bridges as well, so I rather like that synchrony. But while there are many aspects of the two cities that mirror each other – even their names sound similar – there are just as many aspects that differ. For instance, Paris is a city with feminine overtones because of that exquisitely beautiful architecture. Pearlis is the opposite. Its castle, Stoneheart, is dark, imposing stone and its sits heavily over the city…not brooding so much as empowering it. Curiously, though, and it is coincidence or perhaps my sub-conscience had a whiff of returning to Pearlis all those years ago when I wrote The Quickening and teaming it up with Paris, because within the castle grounds are beautiful courtyards that surprise the visitor because of their obvious femininity couched within this masculine hulk of a castle. There are formal courtyards of delicate herbs or peeps into magnificent orangeries. Magnus, the King of Morgravia in The Quickening, loved growing flowers and so we get a sense of that legacy within these imposing walls. I think both landscapes complement each other marvellously – they embrace at certain points and they dash away at others to opposing points…almost like a dance….and now that I reflect on it, perhaps Pearlis is how Paris, one of the great European cities, may have felt hundreds of years ago. I should qualify that you will get a greater sense of Pearlis if you read The Quickening because I had more time to dwell on it. In Scrivener, I move the characters all over Morgravia. Anyway, here’s to you enjoying Paris and Pearlis! 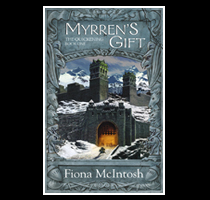 This entry was posted in Scrivener by Fiona McIntosh. Bookmark the permalink.